Sholto Dobie is an artist and performer born in Edinburgh and living in London. His solo output is marked by live performances that are characteristically delicate, evocative and absurd. He uses his own instruments, crudely assembled from materials such as reeds, whistles, bin bags, fans and air compressors, alongside loose performative structures, to respond to places and situations. He plays in Al Fresco (with Lia Mazzari & Tom White) and regularly collaborates with Ben Pritchard, he has also worked with Ashley Paul. He continues to run the event series Muckle Mouth which he founded in 2014. Mark Harwood is a musician and performer born in Ferntree Gully and living in London. His output veers towards uncanny audio both delicate and unsettling whilst his performances rely on teasing out and playing with the mood embedded within any given environment and audience situation. He has collaborated with Graham Lambkin, Aine O’Dwyer, Timo Van Luijk and MP Hopkins and runs the Penultimate Press label which brings forth this very release. The Blue Horse is a beautiful strange journey through a landscape where little is familiar but all are welcome. Made from predominantly acoustic sources, The Blue Horse gracefully hisses, puffs, wheezes, whirls, and clunks it’s way through a series of distinct musical and non musical environments. 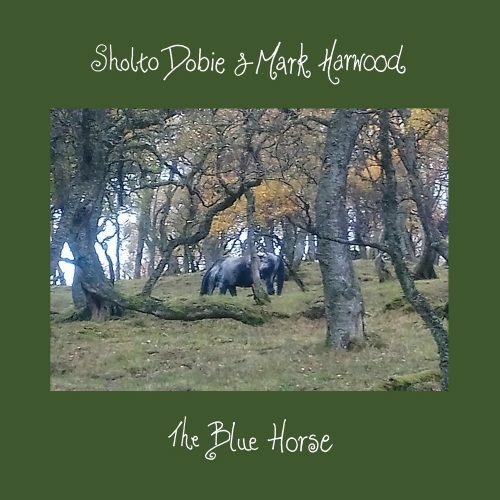 Sounding both at times like a dark and stormy night… and “an elephant trying to get laid”, the ambiguous style of The Blue Horse conceals the artists’ unsettling, fantastical and quietly humorous sensibility. Whilst The Blue Horse lacks any obvious precursors, it’s elemental and environmental leanings potentially tread a path initially mapped out by Moniek Darge and Godfried-Willem Raes in the works coming out of the Logos Foundation in Ghent, Belgium in the mid 80’s. The Blue Horse is the debut recording from Sholto Dobie and Mark Harwood and features a guest appearance from cellist Judith Hamann. “People say he looks blue under the moon”, is what Mhairi told me when I asked her about it. I was walking along the roadside with my partner in the Cabrach, one of the most remote areas in northern Scotland. At a bend in the road, something directed my attention towards the hill and when I looked up I could make out a silvery-blue creature, moving slowly and gracefully, obscured by the trees. It wasn’t clear at first, but I soon clocked that it was a horse and I took a picture of it. Earlier in the day I came across a fairy ring of field blewits, mushrooms otherwise known as blue-legs, so I knew something was up. By the time it was dark (around 4pm in November) we were the only customers in the Grouse Inn, a long-standing middle-of-nowhere tea room and whisky bar, beautifully cared for by Wilma McBain and her daughter Mhairi. Noticing the leather harnesses on display I asked Mhairi about the horse we’d seen earlier in the woods. I was somewhat enchanted just talking about it, and she wasn’t surprised. Later in the evening, we ended up behind the bar in the refrigeration room (where Mhairi paints), she showed us her painting of the blue horse.